"We want to know whether you (Centre) have any disaster management plan. Do you have a policy which deals with graded responses to the situation and provides what action would be taken at which stage? What is the protocol? Now the time has come where we need to have this," SC BENCH. 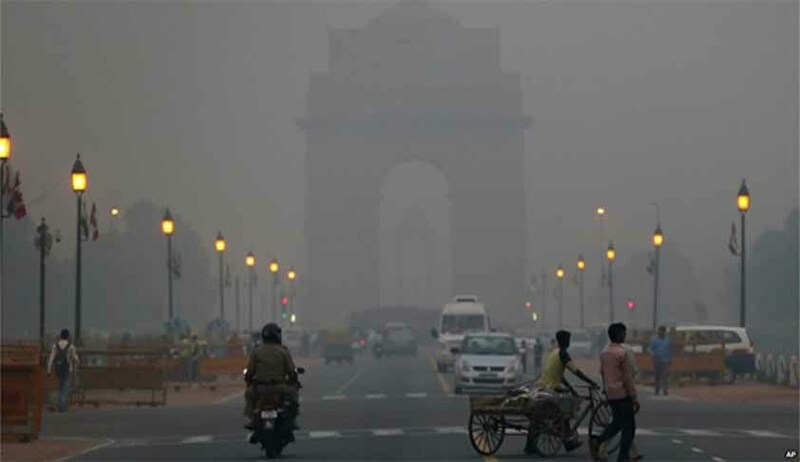 The Supreme Court has expressed concern over the sudden worsening of the pollution levels in Delhi and surrounding areas and directed the Centre to respond within 48 hours and give details about its policy or a "disaster management plan" to deal with the prevailing situation. A special bench of Chief Justice T S Thakur and Justices A K Sikri and S A Bobde also asked the Centre and Kejriwal government to keep aside their differences and devise a "common minimum programme" at least for taking steps to deal with the pollution menace. "We want to know whether you (Centre) have any disaster management plan. Do you have a policy which deals with graded responses to the situation and provides what action would be taken at which stage? What is the protocol? Now the time has come where we need to have this," the bench said. When the bench sought to know from Solicitor General Ranjit Kumar about the policy to deal with the rising pollution levels and asked whether the Centre monitored the situation, the SG said said unregulated "commercialisation" and "industrialisation" of Delhi was one of the reasons for the present situation. "In last 60 years, Delhi has grown in such a manner where there has been unregulated urbanisation. The vehicles have grown in numbers. If you cover a distance in one hour and 20 in contrast to 20 minutes, then it adds to pollution," he said and sought two days time from the court to seek instructions from the Centre in the matter. The court’s remarks came after it perused the report filed by the Environment Pollution Control Authority appointed by it. The report said levels of PM2.5 has increased by 1.4 times on November 5, 2016 as compared to Diwali. It is 14 times the standard on November 5, 2016 – a situation, which is both alarming and dangerous for human health. This is a level of pollution, which is higher than what was recorded during the London smog incident and certainly higher than what has been seen in Delhi ever. The key cause of this extremely high pollution that is seen in Delhi and its vicinity is a combination of factors – already high pollution in Delhi because of numbers of vehicles; unchecked construction and road dust and garbage burning; compounded by Diwali crackers and the burning of paddy residue by farmers in Punjab and Haryana and near still weather conditions without wind and the onset of winter, it said. This severe smog episode is a result of these factors and must be treated as a public health emergency. It is also clear that these conditions demand emergency measures – short term and immediate, which will drastically reduce pollution during the peak smog episodes. o Strict enforcement of ECC on Delhi-bound trucks so that there is control on numbers, including enforcement to check and divert all non-Delhi bound truck traffic and age limit (as stipulated by Hon’ble Supreme Court). Ensuring the early introduction of RFID will improve compliance and enforcement of this measure. o Strict enforcement by GNCTD and municipal bodies of Hon’ble Supreme Court directives on control of dust pollution from construction activitiesand road through vacuum cleaning; water spraying and horticulture. o Strict enforcement by GNCTD/municipal agencies on ban on garbage burning. Long-term action on control of emissions from garbage burning needs to be assessed and taken. o Urgent action to control pollution from thermal power plant in Delhi and its vicinity by shutting down plants during winter months and moving towards natural gas based power plants in the long run. Urgent action to reduce pollution from fly ash dumps in thermal power plants. o Strict action by Punjab/Haryana to control biomass burning through enforcement and by providing farmers alternatives to use paddy straw for energy and for tilling into ground for manure. o Strict enforcement by all pollution control boards on control of air pollution from industries, brick kilns and other sources of air pollution. o Enforcement of all actions and directives to move vehicles towards cleaner technologies; fuels and emission standards. This includes move towards BS IV (nationwide) by April 2017; BS VI (nationwide) by April 2020; increased introduction of CNG in NCR as already directed by Hon’ble Supreme Court and control on dieselization of vehicles. o Comprehensive steps to augment public transport in Delhi and connectivity with NCR, including bus, rail, metro and walk and cycle for last mile connectivity and increased parking charges. This is the most important action that needs to be taken urgently as it is the only way that Delhi/NCR will be able to address air pollution and restrain the growth of private vehicles. The Hon’ble Supreme Court has already directed GNCTD to augment bus fleet and metro to increase its passenger capacity. But much more needs to be done to build public transport network with last mile connectivity and governments in NCR along with Union Ministry of Urban Development must provide the comprehensive and multi-modal plan, which can then be monitored for implementation.